1. The general even-ness in distance among motifs — that’s what gives the overall look. Evenly spaced motifs give the eye a sense of uniform continuity, and do not draw attention to one particular spot on the quilt. Now, it’s not going to be “exact” in the even-ness. As long as there’s not a gaping hole that screams “quilt” me in your quilted area, you should be okay. 2. 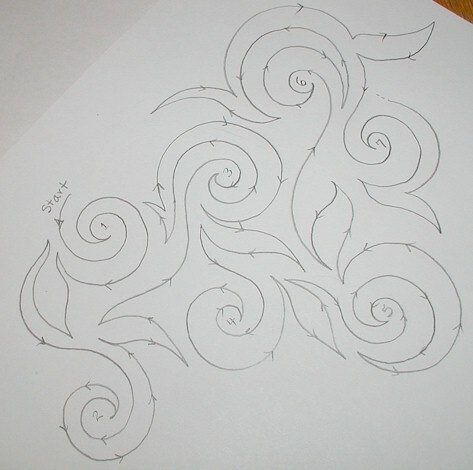 The continuous movement from one motif to the next repeated motif is a flowing one. 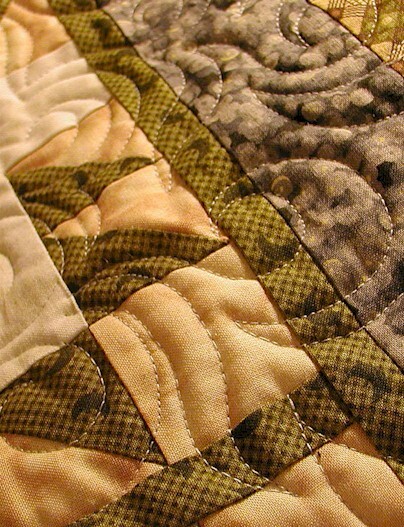 In other words, the connecting line you quilt after you quilt one motif should be such that it wouldn’t look dis-jointed from the previously quilted motif, and awkward when connected to the following motif. 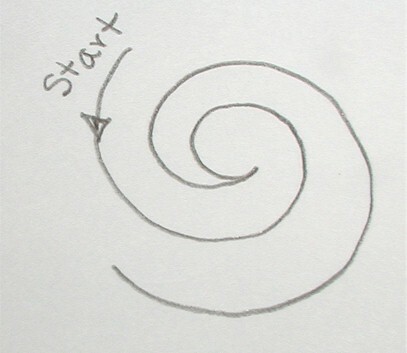 And you keep building these swirly tails from that last schematic diagram! 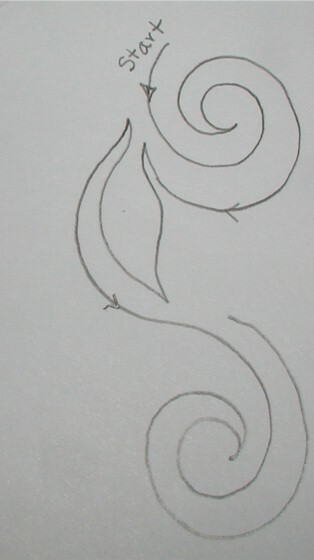 These swirly tails are a bit more complex than my plain ol’ swirls. 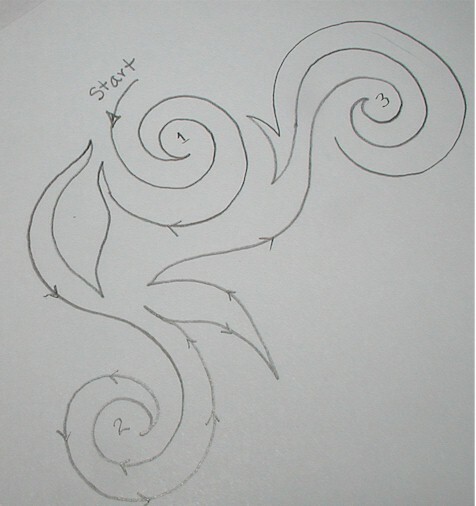 So, if you aren’t familiar with the swirls, see if this helps. 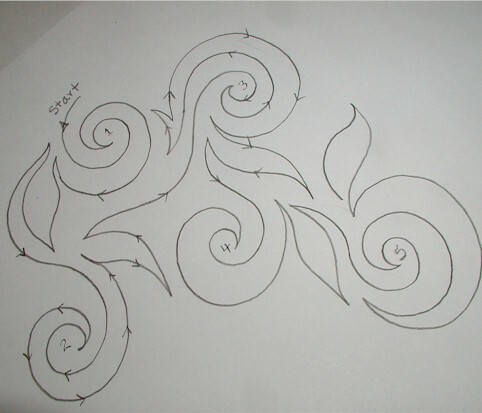 Play with the plain swirls first before you add the tails! This entry was posted in Freebies, Ideas, Tutorials, Quilting, Thread Talk and tagged Domstic Machine Quilting, Free-moition Quilting Tips. Bookmark the permalink. These posts are just so helpful! I’m very grateful for the info. Of course, I want more. What is the size of these motif? Do you draw off a grid or anything to make sure you are placing them evenly across the quilt, or do you just go with it? Also wondering what is the approximate distance between the “echoing” of the curved lines. Thanks! Thanks so much for this tip and tutorial…it is wonderful! Thanks so much for this post. 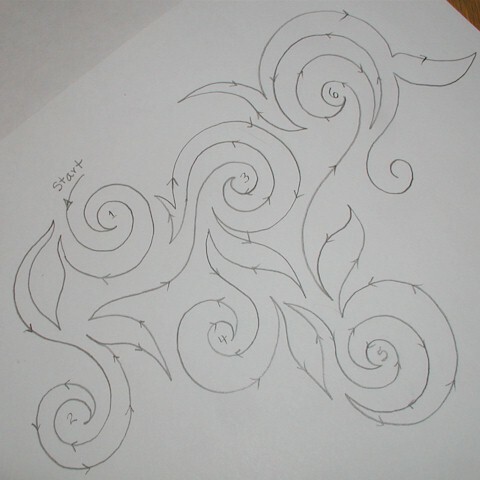 Helpful hints for furthering my FMQ skills which need all the help they can get. This is so helpful. I wonder if I can adapt it to my small space. My throat is only about 5 inches. I love this design. Thank you so much for sharing your talent in a way that is accessible and inspirational without feeling daunting in the least. So pretty Wendy – what do you do when you get to the end, to make sure you have enough room? I would end up squeezing that last one in and it would look funny, lol. Beautiful and thank you for the details. Swirls and spirals are my favorite motif to quilt. I wish I had had this info before quilting my last quilt. But there is always another one to do. Lovely, as always! I could actually follow the diagram — it does make it look more doable than I would have thought. Just love your thread talks. Thank you for sharing your schematics. That sure helps to understand how you do what you do! Excellent tutorial! Your diagrams are so helpful. wonderful, can’t wait to give this a try. I really like this all over design. It’s definitely one to try on my next quilt. I’m in over my head on my current 80″ X 80″ FMQ piece, with a state fair entry deadline! Have a great weekend. Hope that berry-picking works out for your little family. Blessings. Thank you for sharing the steps on how you do the overall design. Once I see the design broken down it makes it so much easier to practice. 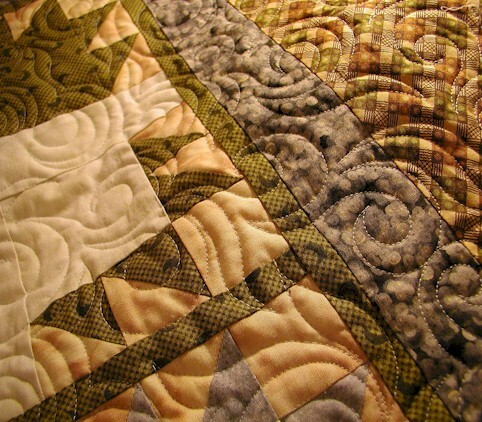 Every time you do one of these thread talk posts, I am so tempted to try some free motion quilting. One of these days I actually will! I could follow your diagram but can’t imagine being able to manipulate the quilt sandwich quickly enough to do that with the sewing machine! Love these tips! I might be getting brave enough to try doing some of my own quilting! Thank you for this excellent explanation!!! love this idea, thanks for sharing.I dam always excited about new ideas!